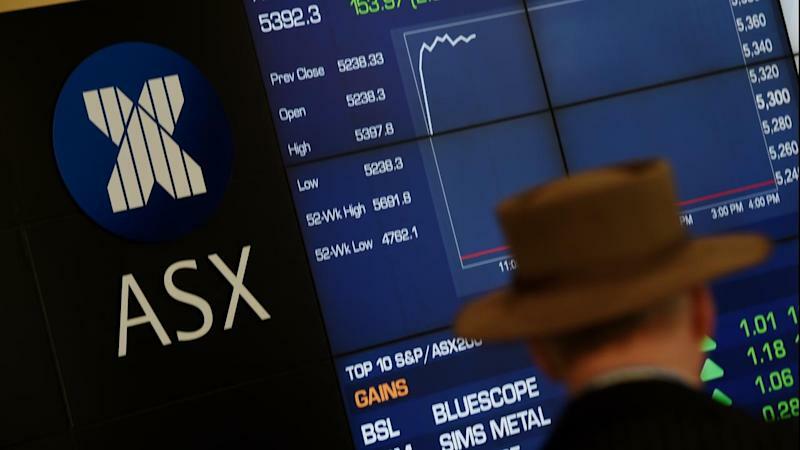 The Australian share market has closed higher with gains for consumer, banking and IT stocks continuing a positive lead-in from Wall Street on Friday. The benchmark S&P/ASX200 index ended the day up 0.23 per cent at 5,957.3 despite a flat performance for energy and mining stocks. US markets made strong gains overnight following the passage in the United States House of Representatives of a tax reform package that would reduce the corporate tax rate from 35 per cent to 20 per cent, among other measures. Phillip Capital senior adviser Michael Heffernan said US-related stocks and the local banks were immediate beneficiaries, while individual performances from online retailer Kogan - which gave a positive trading update - and takeover target Santos added to momentum. "There's a few striking things here today - from the mini-Amazon Kogan.com up more than 10 per cent, to a Santos-inspired infectiousness - there is takeover tension in the air and that can flow into the whole market," Mr Heffernan said. Shares Kogan rose by 12.6 per cent to $4.29 after founder Ruslan Kogan revealed revenue growth of 36.2 per cent for the four months to October 31. Australia's four major banks closed higher with ANZ up 0.6 per cent, National Australia Bank up 0.4 per cent higher, Westpac by 0.3 per cent Commonwealth Bank up 0.1 per cent. With iron ore prices slightly off the big miners ended mixed - BHP Billiton down 0.6 per cent, Rio Tinto down 0.5 per cent and Fortescue Metals up 1.5 per cent. Santos, which revealed on Thursday it had knocked back a takeover bid from a US investor, added to Thursday's gains, up by 1.2 per cent to $5.01, while Woodside Petroleum fell 0.4 per cent and Oil Search dropped 0.6 per cent. Virgin Australia's share price leaped 15 per cent to 26.6 cents in activity that earned a query from the ASX. Virgin said while it was not aware of any information to explain the activity, an analyst presentation delivered at a Sydney investment conference may have contributed. Fairfax spin off, Domain ended its second day as a listed company, down 0.3 per cent, at $3.68. Shares in gaming giant Tabcorp were up 5.1 per cent, at $4.99 per cent after the Australian Competition Tribunal again approved its merger with rival Tatts. The Australian dollar suffered a sharp fall in afternoon trading and at 1700 AEDT was 75.70 US cents compared to 75.96 on Thursday. Currency strategists were hard-pressed to find a clear reason for the dip - which after a week of declines sees the Aussie at its lowest level since June. However some suggested it may be a risk-off response to news the US special investigator looking into Russian ties to the Trump presidential campaign has issued subpoenas requesting documents from campaign officials. * The broader All Ordinaries index was up 14.8 points, or 0.25 per cent, at 6,038.3 points. * National turnover was 3.9 billion securities traded worth $5.2 billion. The spot price of gold in Sydney at 1700 AEDT was $US1,281.90 per fine ounce, from $US1,276.31 per fine ounce on Thursday. * December 2017 3-year bond futures contract at 98.04 (1.97pct), unchanged.